I sometimes think that the defining element in my understanding of photographs derives from the way that, for years, I never thought about who had taken them. Actually, that is to understate things; beyond the fact that a button was pressed it didn’t occur to me that they were or could be by someone. Photographs were entirely about who or what they depicted. I date my interest in photography from the moment I learned that a picture of D.H. Lawrence of which I was particularly fond was made by Edward Weston, a major figure – to put it mildly – in the history of the medium. Before this there was the old way of looking at photographs; afterwards, the new way. The covers of ECM records have always played an important role in defining the record label’s identity. It is less striking now that their releases are only available as CDs or downloads; back in the days of the LP the cover played, quite literally, a much bigger part. The design managed to covey the overall constancy and ethos of the ECM project while suggesting the particular character of the music within. I’m thinking today of one such album: Playing by Don Cherry, Charlie Haden, Dewey Redman and Ed Blackwell. Popularly known as the Old and New Dreams band – after the title of their first release – this was actually their third album, recorded live in Bregenz in 1980. 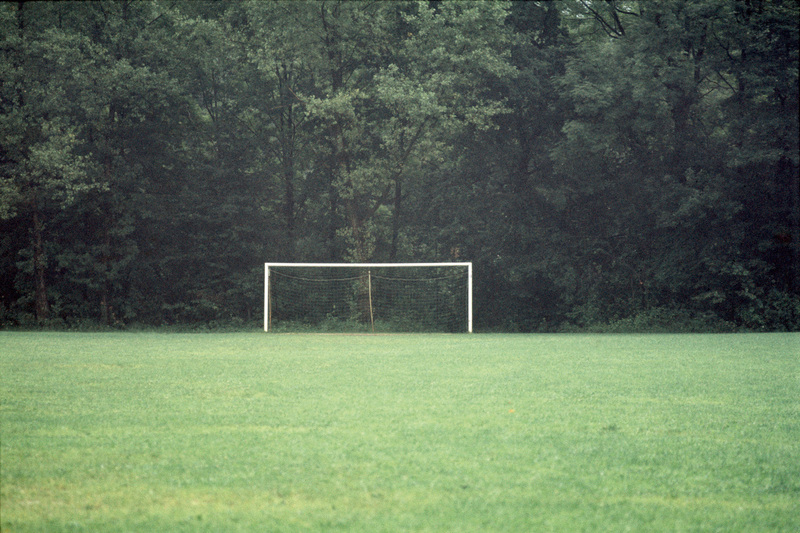 The cover featured a lovely photograph of an empty goal post, very white, backed by a wall of dark green trees (almost a forest). In front of the goal was the lighter green of the pitch, the lines of which – six-yard box, penalty area – were impossible to see. Like this the goal became something tangibly abstract, and the pitch almost a meadow. I had to wait more than 20 years to properly appreciate the identity of the photographer, to recognise him. I was looking through Kodachrome by Luigi Ghirri (1943-1992), an Italian photographer I had only recently become aware of. And there it was: the same picture – but, as often happens in these circumstances, slightly different. In its ECM incarnation the forest had lost some detail, its implied depth, and the grass was somewhat yellowed, drier looking, either because of faulty reproduction or because, over the years, my particular copy of the CD had faded. The biggest change, however, was simultaneously subtler and clearer, and it was what might be called Ghirri-esque. Like many Ghirri pictures this one is quietly but rigorously self-enclosed. The frame within the frame – the frame of the goal posts – concentrates our attention absolutely within the frame of the image (which on Playing had been framed again by the white background of the album cover). In the picture there is no narrative to suggest what might be going on either beyond the spatial frame or beyond the moment depicted because – and this is often the case with Ghirri – there is absolutely nothing going on within it, no hint of movement (which perhaps renders inappropriate the quotation from Handke on Playing). This is what a still from a dream might look like. Pellucid and infinitely mysterious, each picture contains almost no incentive to move on, to turn the page and look at another. We are content to look and wait, to attend. The experience might, in this context, best be described as ‘Staying’. So it’s convenient that, on the page facing the picture of the goal, there is a similar and perhaps more extreme image: a basketball net in Paris, surrounded by walls, within which are two black-bordered rectangles: the back-board and a smaller target area painted on that. Ghirri also likes views of places in which a mirror consolidates the feeling of sealed-in-ness by blankly and greyly reflecting on one or more of the surrounding walls. But sometimes these mirrors serve as windows, discreetly breaking the seal, affording glimpses of another world of flesh, tanned arms, bikinis. Though calm, even serene, sometimes playful, the narrative allure of this world is considerable. The double quotes perhaps double as a description of what happened when I recognised the Playing photograph in the Ghirri book – an incident which can in turn stand for the larger experience of my interest in photography. An isolated picture of a goal, pitch and trees – a kind of dead end – became part of a larger world of images. A new world opened up, a world characterised by its sealed-in-ness, every glimpse of which seemed both complete unto – and to suggest something beyond – itself. That seems to be Ghirri’s vision and goal: photography’s old and new dream. Geoff Dyer (*1958) is a British author. His most recent book is Zona, about Andrei Tarkovsky’s film Stalker. A Portuguese translation of this piece was published at revistazum.com.br. Posted on September 27, 2013 December 8, 2016 by vsmallfires	This entry was tagged ECM, Edward Weston, Francesco Zanot, jazz, Luigi Ghirri, Peter Handke. Bookmark the permalink.